A plane was taking off from the Airport and after it reached a comfortable cruising altitude, the captain made an announcement over the intercom, "Ladies and gentlemen, this is your captain speaking. Welcome to Flight Number 293, nonstop from New York to Los Angeles. The weather ahead is good and, therefore, we should have a smooth and uneventful flight. Now sit back and relax.. OH, MY GOD!" Silence followed, and after a few minutes, the captain came back on the intercom and said, "Ladies and Gentlemen, I am so sorry if I scared you earlier. While I was talking to you, the flight attendant accidentally spilled a cup of hot coffee in my lap. You should see the front of my pants!" A passenger in Coach yelled, "That's nothing. You should see the back of mine." If you have ever been on an airplane you can understand the feeling of giving complete control to the pilot and his crew to get you to where you need to go. I remember my first plane ride – I read the safety evacuation manual, paid attention the seatbelt instructions, sat with my seat belt fastened the whole time, listened to the Captain verbatim – your basic worrywart. In life we find ourselves in situations where we need to relinquish control and essentially put our trust in someone to get the job done. 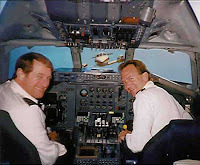 You’ve read about my experience on an Airplane listening to the Captain, but what about the Manager who puts faith in their staff hoping not to be let down or the parent/student who believes in their teacher trusting in their curriculum plan? The premise being: teachers need to get “hands on” with education – a good coach “skates” on the ice. Keeping with the hockey mentality Booth tells a story about listening to former Montreal Canadiens Coach Jacques Lemaire talking about how he grew up illiterate. Lemaire admitted that he had hid his problems from all his teachers and didn’t tell anybody during his time as Coach for Montreal. It wasn’t until he turned 60 years old that he finally admitted to not being able to read and began to take lessons. Lemaire said, “Those who are willing to learn – will learn.” Booth also emphasized this through an emphasis on harvesting student potential. When the video was over the group I was sitting with began to discuss the speech. They said they were confused about the Lemaire reference because they all agreed that you cannot force a student to want to learn – it’s impossible. But, what I think Booth was trying to say is no matter who you are, even Jacques Lemaire, if you are willing to learn – it will happen. As good coaches sometimes we will need to wait for some of our students, no matter their age, to come around. There are going to be moments in life when we need to place our trust in someone else. But, if you think about it, putting your trust in someone else is a lot like being willing. Of course the goals need to be reciprocal – you can’t have someone taking advantage of your trust. But, if you can show your willing and offer your trust there is no limit to what yourself and others can accomplish – together.